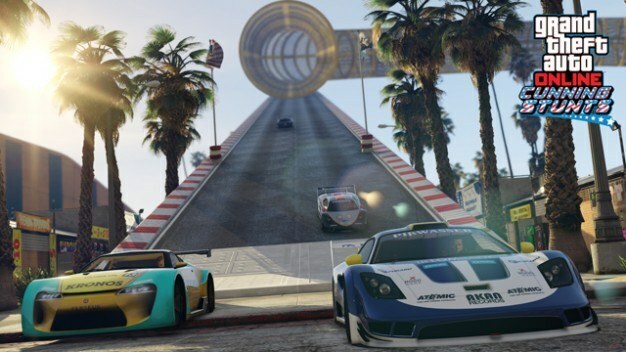 As of today, there are five new stunt races added to the GTA Online: Cunning Stunts. This new content will take you all over the globe so you can quench your adrenaline thirst. Furthermore, next week the Stunt Race Creator tool will allow players to create, and publish their ideas for even more mayhem. In addition to all the options for races, there are three new vehicles added as well. This iconic piece of the Earth has been the muse of artists, and eclectics alike. However, now it serves a much larger purpose; the super car enthusiasts of Los Santos. This race goes over the San Andreas peak as a bit of added nostalgia. Take a tour on a new sports track that is a little waterlogged. Be warned that as you are racing water can flood the track and your engine. This new race is designed for sports cars. This is also a Premium Race from Friday, June 29th to Sunday, June 31st for a top prize of $100,000. Get ready for a little speed on two wheels with the new bike race. Although most of your time will be spent soaring through the air above industrial docklands. Even though these bikes weren’t made for this, we must push onward. It is a known fact that people tend to drive a little more conservatively when a wrong turn can send your car careening to the bottom of the ocean. 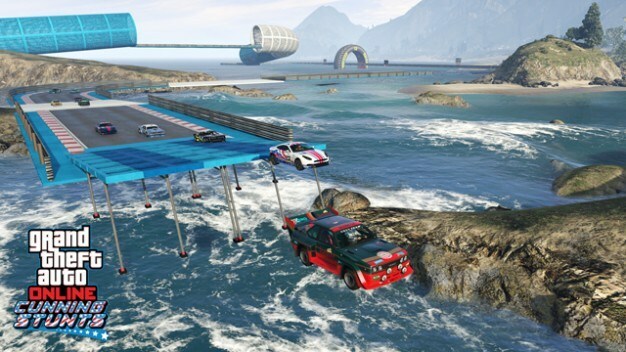 Keep that in mind as you race above the Los Santos coastline. A fun trip on your bike as you face a force ten gale; welcome to The Wave. All of the races are incredible. However, races are no fun without amazing new cars to try on them. These three new cars are the Bravado Sprunk Buffalo, MTL Dune, and the Vapid Contender. The Sprunk is a brand new beautiful SUV, or maybe go off-roading in the MTL Dune. 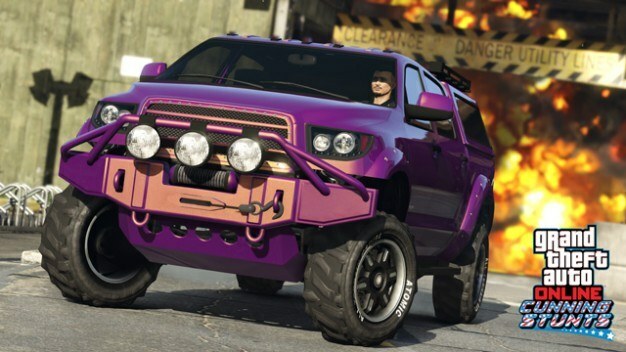 The Vapid Contender features a good size and suspension making it a viable choice for multiple terrains. 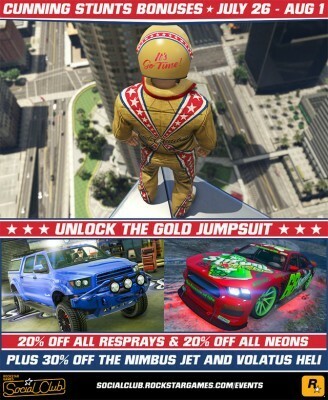 As an extra fun bonus as long as you log into GTA Online before Monday, August 1st you will be rewarded with a delicious gold jumpsuit. All resprays and neons are 20 percent off. And if that was not enough, the Buckingham Nimbus jet and Volatus helicopters have a nice 30 percent discount at Elitas Travel.